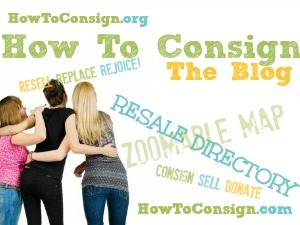 Are you a resale or consignment shopkeeper who is a bit overwhelmed with work… and a bit underwhelmed with profit? Click for a video message from Kate. Around our house, December 31 is the day we pack away the decorations for next Christmas. When we take down the tree and pack away the stockings, we do something that preserves the memories of Christmas Past for Christmas Future. We secretly write a little dated love note/ memory missive and tuck it into the toe of each person’s stocking to be discovered next Christmas. you’ll have a lifetime’s worth of memories to relive again and again every Christmas. Posted in How to have a Merry Recycled Christmas, ReJoice! Get your ears into the spirit of Christmas! I won’t mention to you all the seasonal songs available all over in all sorts of format. I’m sure you have your favorites. But I’ve just discovered Christmas podcasts! Santa’s list of the 10 Things You Should Always Buy Used. Just click to find out! My Christmas Stocking Every episode features at least one Christmas song, sometimes traditional, sometimes something you may not have heard before. You’ll also hear the stories behind our favorite traditions and other surprises. Christmas Radio Shows In the 1920s, 30s, 40s, and 50s families gathered around the radio to listen to the long-awaited Christmas editions of their favorite shows, making for great memories. Christmas Past tells the stories behind your favorite holiday traditions. Each episode is 10-15 minutes long, and features interviews with experts, archival audio, and Christmas memories from listeners. Another place to enjoy and get terrific ideas from? 50 Days & 50 Ways to Have a Merry Recycled Holiday, a blog brought to you by… us! Nope, we didn’t think so. That’s a lot of money. Yet that’s the per-capita estimate of what Americans will spend for holiday goodies. Per capita! That means that if you’re a family of two, you’re looking at a cool two thou in debt. Alas, no one forecasts how long those credit-card bills will be around to haunt folks. Consumers say they will spend an average $967.13 this year, according to the annual survey conducted by Prosper Insights & Analytics. That’s up 3.4 percent from the $935.58 consumers said they would spend when surveyed at the same time last year. —Read the full article. So how to have a warm, welcoming, even extravagant holiday season without drowning your family in debt? Well, that’s easy. Go the previously-loved, even previously-gifted gift, decor, and entertainment route. Follow these links and see how BIG your celebration can be, while keeping those January bills SMALL. Making a bit of spare cash ahead of time. Scouting out some new retail resources. And of course, YOU deserve the best gift of all. The perfect gift for THAT friend. You know the one I mean. What do you get the friend who seems to have everything? Something totally unexpected, useful, and unique. The holidays would be blissful… if only you could think of the perfect gift for THAT friend. 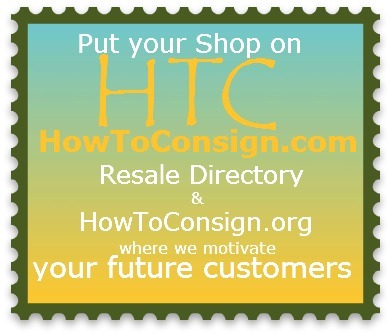 Click the pic to find a Professional Resaler near you! ❄ For the frazzled executive: A Midwinter’s Night basket, with several paperbacks, a big mug to warm his or her hands on, and maybe a cozy throw or pillow. Nestle it all in midnight-blue tissue paper and trim with star garland. Include several envelopes of gourmet cocoa mix. ❅ For the too-old-for-toys kid: An Invention Kit. Fill a deep basket with old toy parts, broken watch innards and costume jewelry, bits and pieces that could be “invented” into something fantastic. Look through the housewares section for old sieves, knobs, handles, even an egg-beater. Finish off with several types of glue, poster board, and paints from the discount store and you’ll have a gift to keep a child happy and away from those screens. ❆ For the grade-school teacher: An Amuse-the-Pupils selection of whimsical animal pins she can use to teach with. Resalers have a vast selection of tiny treasures for tiny prices. Nestle them all in a bright scarf and tuck into a (what else?) apple-red carrier you create with a resale basket or a box sprayed with red enamel. ❇ For the little ones: A Dress-Up Trunk. Fill an old suitcase or small trunk with an inexpensive satin “ball-gown”, netting, a feather boa and satin high heels. Fancy old hankies, a “gold” purse, sparkly costume jewelry, even a fruit-trimmed old hat. The gaudier the better! For her “date,” a vest, tie, beat-up fedora and wingtips. A broken wrist watch and an old briefcase will bring hours of fun. 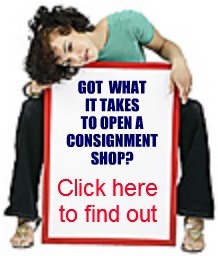 Look for the shop’s “as-is” rack for slightly-damaged items at a great discount. ❈ For your best friend: A No Woman Ever Has Enough Accessories selection of her favorites. If she’s proud of her small waist, select half-a-dozen unusual belts (and use the fanciest one as a ribbon on the package!) Is she flamboyant? An armload of bracelets lined up on an elbow-length black glove (stuff with cleaner bags) is an amusing gift. Is she the dress-for-success type? Grab a variety of scarves and tuck them into a designer tote she’ll use every day. Resale is a treasure-trove of items you won’t find at the mall, from tongue-in-cheek statuettes to chic designer accessories. 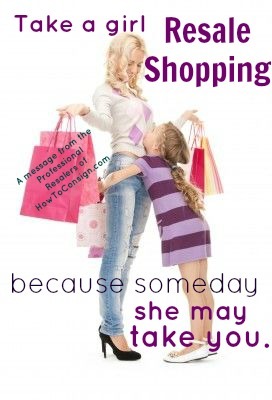 Once you get started gift-shopping resale-style, you’ll find it hard to stop!